The Lower Campus maintains a partnership with the Ann Norton Sculpture Garden, located next door to the school. 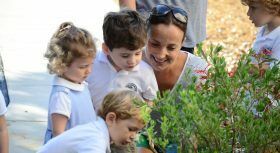 The collaboration allows Primary students to gain a deeper understanding and appreciation of the work of sculptor Ann Norton and the collection of plants in the garden that bears her name. All Primary students also participate in the Week of the Young Child in April. 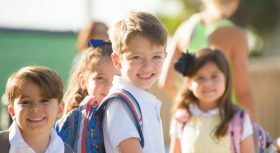 Organized by the National Association for the Education of Young Children (NAEYC), Week of the Young Child focuses on a different topic each day. In 2016, the topics were Music Monday, Tango Tuesday, Work Together Wednesday, Artsy Thursday and Family Friday. Finally, each May the Primary students celebrate Water Day. Each year, the Kindergarten classes spend September learning around the theme of teddy bears. At the end of the month, the Teddy Bear Picnic takes place. This long-standing tradition includes a “bear hunt” for lost teddy bears, music, stories and a picnic with the Kindergarten families. Since 2012, docents from the Museum and the Kindergarten teachers have collaborated to bring rich experiences based on fine art to our students. The partnership includes visits to PBDA from the Norton’s docents and trips to the Museum by our students. Thinking routines that originated at Harvard’s Project Zero are used to help students think more deeply about the role of museums as well as how to examine works of art. Using engaging techniques to teach concepts is a hallmark of the Kindergarten Program. A good example of that would be the “Wedding of Q and U.” In order to teach students that the letters “Q” and “U” go together, a wedding between the letters takes place complete with a “groom” in tuxedo and a “bride” in a gown. A reception takes place after the ceremony. Students never forget that these two letters go together! First grade has built a robust partnership with these two institutions. Starting in 2011, this partnership features multiple visits to these community resources during the year as well as visits by these institutions to our campus. This partnership uses the theme of “collections” to drive their work, and this theme now permeates the grade’s entire curriculum. 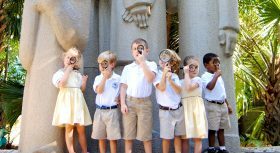 In May, first grade students do a special one-hour presentation at the Flagler as a culmination to the yearlong partnership with both institutions. A variety of versions of the Gingerbread Man stories are compared and contrasted. The students each write their own unique Gingerbread Man story, make gingerbread Play-Doh, design/engineer a student-sized gingerbread house and conclude with decorating gingerbread man cookies. This study is a multi-disciplinary unit based on the book by Ruth Stiles Gannett. The story serves as a springboard into the concept of animal classifications/habitats. The students also utilize map, measurement and graph skills. 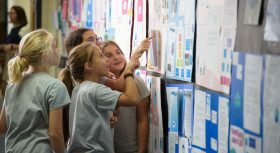 They design, engineer and test an alternative method of travel from one island to another and complete several art projects including a “missing poster” designed using Microsoft Word and a diorama. The unit ends with each student researching and reporting on an individual animal. This interdisciplinary unit encompasses science concepts related to animal camouflage. With a partner, students conduct research and write reports about the animals they’ve studied. Art is a component of the project as the students collaboratively design costumes and dress as the animal they have studied. This work is shared with the school community through an oral presentation at Flag Assembly. During the weeks that the Iditarod is taking place in Alaska, second grade students are involved in a comprehensive, interdisciplinary study of this incredible event. Students read a novel about the Iditarod and complete STEAM activities as a grade level. Taking place in May, this simulation is a culminating activity after an interdisciplinary language arts and social studies unit on immigration. Students assume various roles during the simulation and experience what it would be like to enter Ellis Island as an immigrant. Throughout the simulation, students board a ship and experience the many tests and assessments people went through coming in to Ellis Island. Students in Grade 3 delve deeply all year into learning about the four Global Competencies. As they do, they partner with Food For the Poor to learn more about their work in Haiti and other places around the world. As part of this exploration, students learn to “take action” and do so by creating garden beds for an orphanage in Haiti. Using Stanford’s five-step Design Thinking Process, students create what the beds will look like. In 2016, our team of third grade teachers traveled to Haiti during Spring Break to build the beds at the orphanage. Third graders spend several weeks at the beginning of the year establishing positive class communities. Each class choose a name for their class, and students decide on appropriate “jobs” for the year. In October, students begin writing campaign speeches for the job they would like to hold during the year. These polished speeches are delivered to their classmates, parents and invited guests. As a culmination to a 12-week interdisciplinary study centering on conservation versus development issues, third grade students produce an hour-long trial at the West Palm Beach Courthouse in front of the Honorable Judge Lisa Small. This project incorporates all disciplines as students conduct scientific research, write their arguments for the trial, learn about the judicial process by working with attorneys and the judge, then take part in the actual trial, which parents and guests are invited to attend.